The Max, Boeing’s best-selling model, with more than 5,000 orders, is suddenly a reputational hazard. It could be weeks or months before regulators around the world lift their ban on the plane, after Boeing’s expected software fix was delayed. APRA has recently announced its priorities for 2019. Please see below excerpts that are relevant to the operational risk management and the business continuity practitioners. See here for the full report. APRA has commenced an important project to update its existing prudential standards and guidance on outsourcing, business continuity and information security, which apply to entities in the banking, insurance and superannuation industries. The objective of this initiative is to align prudential requirements with industry better practice and community expectations for a high degree of resilience to material operational risk incidents. In conjunction with these more technical standards, APRA’s intention is to issue broad-based expectations for operational risk management and resilience that align to the overarching risk management framework. APRA will take the opportunity to streamline existing requirements where appropriate. Our reading of the tea leaves is that there could well be considerable changes to the way APRA regulates the Australian finance market in the near term. The outcome of the Hayne Royal Commission and the looming risks from climate change means that it is likely that over the next twelve months our business continuity plans may need to be thoroughly reviewed. Wells Fargo customers were unable to access their online bank accounts for more than seven hours – after smoke knackered one of its data centres. Environment-related risks dominate the report for the third year in a row, accounting for three of the top five risks by likelihood and four by impact. 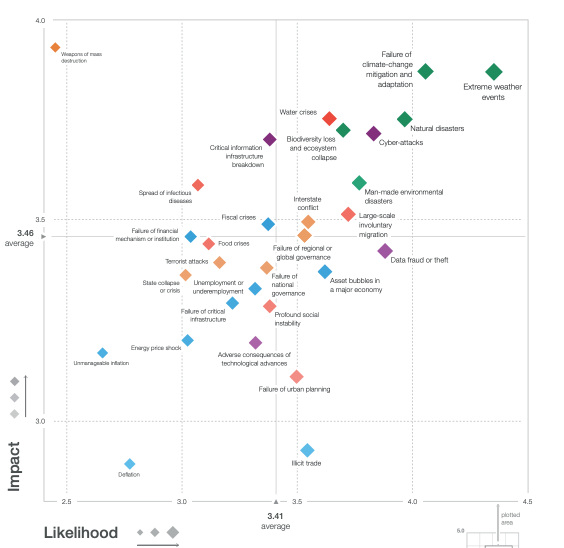 Extreme weather is again out on its own in the top-right (high-likelihood, high-impact) quadrant of the Global Risks Landscape 2019. The report can be downloaded here, or go to the WEF website for more information. Despite sensitive data being increasingly moved to the cloud, research carried out by Databarracks reveals that over 60 percent of organisations have not evaluated the business continuity risks for their cloud services over the past year. From a survey of 400 IT professionals, only 40 percent of organisations have evaluated the business continuity risks for their cloud services in the past 12 months. 17 percent of businesses have no plans to address this over the next 12 months. Further to this, almost a quarter (23 percent) of organisations admit to not having backup or recovery capabilities in place, beyond the standard default options offered by their cloud provider. Cloud failures - both major and minor - are inevitable. What is not inevitable is extended periods of downtime or unacceptable data loss caused by any resulting service outages. Nick Hawkins, Managing Director EMEA of Everbridge, discusses how in crisis situations organisations can use cloud-based platforms to communicate with employees anywhere in the world to identify which employees may be affected, communicate instructions quickly, and receive responses to verify who may be at risk.